The small spout rose up after the large one, straight in front of our sea kayak. "Wow!" we shouted, our paddles raised. "Yes! "said our guide, Scotty, a veteran of Kelli's Kayak and Snorkeling Tours, "Mother and calf are enjoying themselves in these splendid morning waters!" It wasn't long before the two cavorters rose to the surface and flipped their tails in descent. 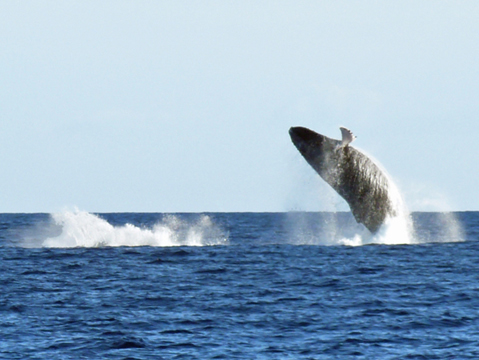 It was as if they were showing their pride at being humpbacks, old and new, in Maui's sea paradise. After paddling along the coast and enjoying several more humpback sightings we anchored our kayaks at a depth of 25 feet and snorkeled a good section of the huge Coral Gardens reef off Maui's southwestern shore. We saw at least thirty varieties of colorful reef fish, an impressive array of coral, and two huge green turtles who swam close before deciding to avoid us. Our morning kayaking and snorkeling tour was the perfect cap to an incredible winter week in western Maui. We had sighted humpbacks from the shore and green turtles while snorkeling each day of our trip. We promised, as we had for fifteen years, to return next winter for one of nature's best shows. The fact that Maui's temperature range from 68 to 84 degrees with temperate snorkeling waters made it easy to visit in winter. 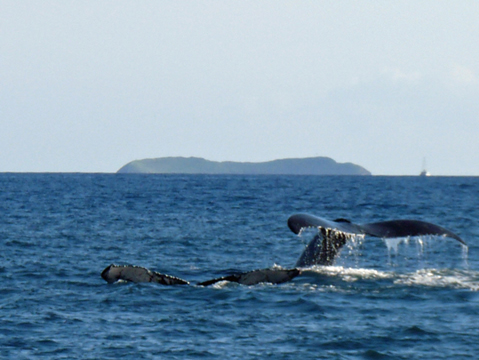 Humpbacks return annually to their preferred water off of Maui's west coast. The waters stretch between the islands of Maui, Molokai, Lanai, and Kaho'olawe, and extend southwest past Molokai. In 1992, Congress recognized the importance of this habitat and designated this critical area as The Hawaiian Islands Humpback Whale National Marine Sanctuary. The geology of this area has made it special for the humpbacks. The critical factor, besides the desired warm water for birthing their relatively fat-free and small calves, is the protection afforded by the low-depth ocean floor. Sharks and other predators of young humpbacks avoid this shallow region that averages but 200-300 feet depth. Its geologic history traces back two million years to a single island, Maui Nui. At that time its size was one-and-a-half times the size of today's island of Hawaii. Over the millenia, Maui Nui and its seven volcanoes eroded. The sea rose and today's group of four islands with a vast low-depth shelf is the result. Humpbacks are one of several "whalebone" species. They have a mouth structure that has two rows of plates (whalebone), 2 feet to 12 feet long, attached to their upper jaw, used for harvesting krill. The krill are planktonic crustaceans and larvae found in their home seas of southern Alaska. When krill are not available during the humpback migration and at their winter home near Maui the whales do not eat. They live off their own fat reserves. The females remain in Alaskan waters longer than their mates to better enable them to provide milk during their long period away from Alaska. Although variable, the Hawaiian whale season is generally December to April. The newborn calves must await their journey to Alaskan seas with their mothers before their first krill meal. Humpback migration to or from Hawaii requires 6-8 weeks for the 3,100 miles. 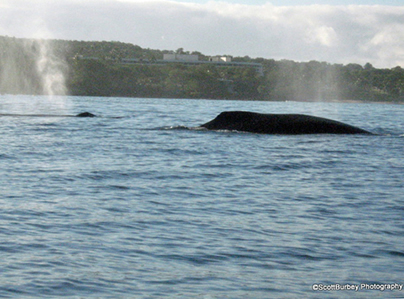 The whale's mating and gestation cycles are still unknown, but the number of females is roughly half that of males. Although both sexes produce a wide variety of sounds, only the male actually "sings.
" The population has increased in recent decades, but the humpback is still on the Federal protected species list due to its depletion by the whaling industry in the 1800s-1900s. Hundreds of years ago, millions of sea turtles swam the Earth's oceans. Today, all seven species of sea turtle are threatened, including Hawaii's most common, the green sea turtle, or "homu." They pre-date many dinosaurs and are mythological symbols of creation, longevity, and wisdom.The green sea turtle, often seen by snorkelers or divers along Maui's western shore, is a gentle vegetarian reptile that weighs up to 400 pounds and feeds on coral reef algae and seaweed. Hawaii's green sea turtles migrate 800 miles from their feeding areas to nesting beaches in the Northwestern Hawaiian Islands. Males accompany the females in this migration and mate with them offshore before the females come ashore to nest. Females return to the beach of their birth 35 to 40 years later to lay eggs for the next generation. Despite laying hundreds of eggs, only a few hatchlings survive to maturity. Hatchlings live in the open ocean for several years, feeding on jellyfish, until they've grown to a point where they can join adult turtles at the vegetarian coastal feeding grounds. The two major enemies of these creatures are tiger sharks in the open ocean and divers and snorkelers in their feeding grounds. Enjoy the sight of a sea turtle while in the reef waters of Maui, but avoid getting closer than several feet. If a turtle "yawns" with open mouth, swipes its flipper, or dives suddently, it is indicating you've violated its safe space. Mau's western shore is blessed with the islands' most pleasant beaches, most of which also provide access to reefs full of sea life. We snorkled half of our days at our favorite beach and reef, Kapalua, and also mixed in snorkeling and beach stays at Napili Beach, just south of Kapalua, and Mile Marker 14. The day that we took Kelli's Kayak and Snorkeling Tour to the Coral Gardens' expansive reef, we enjoyed an afternoon in the village of Lahaina with its restaurants, coffee shops, and taverns. Every day we were able to view whales, swim with turtles and enjoy the coral and sea life of the reefs. Our favorite fish spottings included the racoon butterfly fish, Christmas wrasse and cleaner wrasse, blue-spine unicornfish, white spotted toby, Moorish idol, and yellow tang. The beautiful array of these and other sea creatures was mind-boggling. 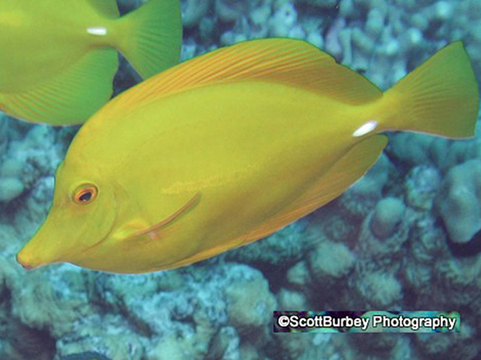 We think of those reefs throughout the year as we await our return to Maui's incredible environment. Will we again be as fortunate to see whales and green sea turtles each day of our next week-long vacation? Standard Web searches easily provide needed information for flights, car rentals, lodging alternatives, and dining. Use Googles maps for the west coast of Maui, and locate the communities of Lahaina, Kaanapali, Kahana, and Kapalua. They provide a broad a range of lodging and dining options. 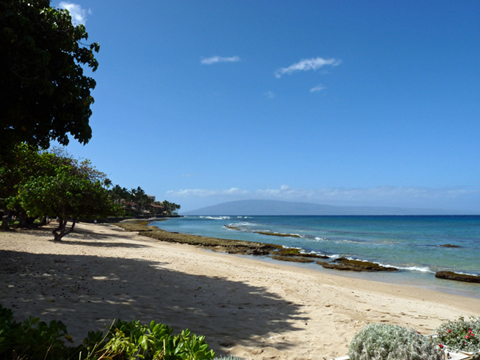 Maui's west coast provides the best array of snorkeling beaches. From south to north on the western isalnd some good spots are Mile Marker 14, Black Rock (Kaanapali) Napili, and Kapalua. Snorkeling equipment can be rented at a number of Snorkel Bob's locations that are convenient to all the major lodging establishments. They also rent bicycles, surfboards, and other equipment. Snorkel Bob's provides access to a number of whale-watching tour opportunities, including the "Kayak and Snorkel" tour mentioned in this article. Other whale watching tour opportunities are available in Lahaina and at Maalaea Harbor. 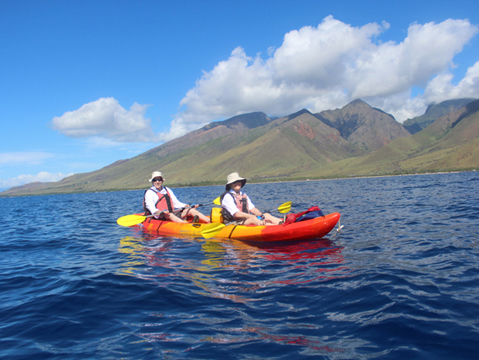 Sea kayaks can be rented for the week from Maui Ocean Rentals, by owner Scott Burbey. He is also available as photographer, and provided several of the photographs in this article. Les and Rita Furnanz originated High on Adventure magazine in April 1997 and were active writing partners until February 2004. On occasion they continue to contribute HOA articles. They visit France, Germany, and Hawaii every year and other world locations from time to time. They are still saying, "Yes... we are High on Adventure!